Dressed to the Canines how to measure for a collar,harness or sweater for dogs and cats. To determine which size collar to order, measure your pet's neck, allowing sufficient leeway for comfort (we suggest adding 2"), and that is the size you order. As a final note, make sure to attach a tag to the collar that has proper identification in case he should get lost. This should include your name and phone number where you can most easily be reached. 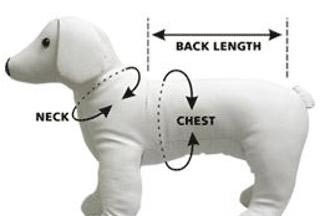 To measure for a HARNESS the area just behind the front legs all the way around the CHEST also known as the GIRTH. I will need the neck size and the girth measurements for a custom harness order. Measure from the back of the neck to the base of the tail.